To comprehend the potential value contained in something, it must be understood what it means in the first place. In order to know how ‘Big Data’ (a regular phrase in today’s global business jargon) brings in real worth to business organisations and CRM solutions, the value of such data should be holistically and intrinsically weighed. The definition of Big Data according to Gartner - "High volume, velocity and/ or variety of information assets that demand cost-effective, innovative forms of information processing, in order to enable enhanced insight, decision-making, and process automation." Technological intelligence and its appropriate application are no longer luxuries; they have in fact become a necessity in today’s economic and industrial scenario. In its “2013 Priorities” predictions report, Gartner concludes that four important words herald the future of technology – Cloud, mobile, social, and of course, information. After in-depth research, Gartner has indicated that business organisations that successfully manage to leverage these four ‘tech territories’, will race ahead of those organisations which don’t. This model, which recognizes the mammoth power of these four technology pillars is called the ‘Nexus of Forces’ – and the model explicates how fruitful the synthesis and mutual reinforcement of the four co-dependent pillars can be. Gartner further explains how the coalescence of these dynamic forces can empower both individuals as well as organisations in mutually beneficial information exchange, through smartly designed, ubiquitous technology. However, it is stressed that though each of these forces have their own set of advantages to businesses, it is important to bear in mind that actual value can only emerge from the union of these forces. Cloud and mobile go hand in hand, and social media works wonderfully with information analytics; all these together contain maximum appeal when they work in unison. As far as companies and their marketing efforts are concerned, only those organisations will be triumphant who can proudly announce their conspicuousness in cloud, mobile, social and information (big data) markets. The Nexus of Forces is making an enormous impact on CRM solutions. The advent of Sales Force Automation (SFA) a few years ago was the first indication of the same. In current times, social networking platforms have given marketing and customer service a face lift, while on the other hand it is being predicted that mobile will be the future enabler for important organisational functions. Even though any CRM solution by its very definition embodies a large quantum of customer information, the Nexus of Forces is further reinvigorating the magnitude, momentum and miscellany of such information. The natural consequence is a revolution in how this multifarious customer data is managed. Gartner foresees big data that as the next disrupter in the Nexus of Forces for marketing, sales and customer service. It is thus clear that big data holds the potential to provide actionable insights which in turn can generate a huge number of customer-related opportunities. However, since these opportunities will span across the “functional tripod” of organisations i.e. marketing, sales, and customer service, they will vary accordingly. In order to draw worth from Big Data, it is imperative for organisations to pinpoint relevant customer services spanning across sales, marketing, customer service and even E-commerce which can derive value from those actionable customer insights that stem from analyzing big data. Following the identification of a customer service process as a ‘big data’ advantage, CRM leaders must work in close coordination with top level executives to ensure that true business gains are achieved. Customer information sources which could be instrumental in formulating effective big data strategies must be identified. The sourced customer data must be systematically managed and integrated. Big data analytics must be leveraged to extract pertinent customer insights. The derived insights must be applied to make appropriate customer-related decisions. Business organisations most often have extensive quantities of both big data as well as customer data - this includes information in CRM solutions. Another facet of available customer information is unused or so called ‘dark’ data which comes from online sources like blogs, speech and location based contexts, texts, etc. The dark data is actually where the maximum untapped potential lies. However, since this kind of information is usually unstructured, it often becomes a major challenge for organisations to manage it effectively. 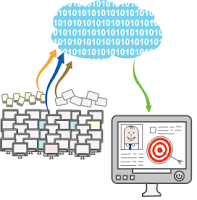 Gathering relevant information from scattered sources is the first step towards deriving big data value. Source identification is the step where relevant data sources needed for big-data-directed processes are uncovered. However, the diversity of sources makes this a tricky phase. All internal, external and potential sources are collectively responsible in contributing an assortment of customer information. Internal data comes from the company’s internal systems. As far as externally sourced data is concerned; suppliers, distributors, partners and other third party data suppliers are contributory factors. Another source of external information is cloud based solutions. Then there is social media, which needs no mention about magnitude and heterogeneity. Together, this can almost lead to an information overload, sometimes making it a Herculean task for organisations to accurately acquire and manage the same. It is therefore important for organisations to be able to determinate the most fitting customer data sources, which will be in congruence with both organisational objectives as well as customer processes. Other critical considerations are privacy terms and legal usage policies with respect to information sources as well as management. An interesting observation by Gartner is that most companies still depend on structured data lodged in their internal marketing and customer databases, or data coming from third-party suppliers. Very few are capitalizing on unstructured information which is mostly rooted in mobile initiatives and social networks. Gartner predicts that 2013 will witness an increasing number of organisations who are willing and able to amalgamate structured with unstructured data stemming from multifarious sources towards their big data CRM drive. As discussed above, contributory information sources towards big data CRM initiatives will be widespread. This is exactly why information management and integration will be pivotal. Appropriate administration of information is the next step towards achieving value from big data. This involves effective information management using big-data-supportive technologies, data quality tools, master data management (MDM) solutions and finally an enterprise information management (EIM) discipline. Organisations are usually well equipped with advanced, well-defined tools and techniques for the integration and management of hierarchical and structured data. This is primarily because such kind of information has a pre-determined structure, well known optimization and a more or less fixed pattern. Secondly, the structured data is stored in conventional marketing, sales, and / or customer database systems, making it more easily accessible and modifiable. The large quantum of unstructured data arising from social, mobile and speech data sources is where the challenge in information management lies. This happens because organisations have become habitual in the management of structured data and their relational data systems. Ironically, majority of big data CRM initiatives will need the management, integration and analysis of structured and unstructured data both, in order to bring forth actionable insights. Unfortunately, existing information technologies and infrastructure cannot simultaneously handle both information types. Heterogeneous cases can be best managed when multiple data sources and multiple data types can be consistently integrated using well designed processes and practices. It is important to use proper integration methods to merge the two data categories (structured and unstructured) in order to effectively create a single customer view. The next step would be application of the same at various levels in the technology stack, which would produce results varying from strategic to tactical – both of which are equally important for businesses. Achieving a single customer view also requires the creation of a strong foundation for future applications along with a physical MDM master. All the above will need utmost dedication from C-level executives, who will have to put their heads together with CRM leaders to ensure all of the above are actualised. Overall organisation coordination and commitment with respect to resources and time is also a must. Application of advanced techniques for analysis is the third step in the process of value derivation from big data, so that fruitful customer insights are generated. A variety of analytical tools and capabilities can be applied which will yield different kinds of insights – insights which will hold the potential to bring about accurate customer decisions. Customer analysis analytics answer vital questions like what is happening, why is it happening, what will happen in future, and how the organisation can be instrumental in making something substantial happen in the future. Getting actionable answers to all these questions forms the crux of successful big data CRM initiatives. Understanding what is happening and why, will unveil several new opportunities for organisations to sell more to customers and take a lead in preventing customer service problems. The next step forward for organisations will be to understand what opportunities the future holds and what their contribution to it will be. What and why questions generate data that helps in creating a concrete foundation for the next two levels. At present, most CRM initiatives are focusing on taking action in concern with the first two questions. However, in areas like marketing, gaining a better understanding about what the future is likely to showcase, will ensure better cross-selling and up-selling efforts. Only a handful of organisations are taking the lead in exploring what substantial role they can play in the predicted future. To achieve the desired objectives and generate fecund business results, the customer insights which have surfaced must be converted to useful action. Here, information application translates to the application of the surfaced customer insights to the relevant customer processes and decisions in a manner that positively benefits the organisation as well as the customers. This is the final step in the derivation of rich value from big data. For example, social listening is an inseparable part of the social networking world. Here, companies must actively ‘listen’ to customers on social websites, so they can understand new patterns, reinforce the existing (positive) ones, and basically get a clear picture about customer perception about their brands/ products and even the organisation in general. The reaction to such feedback will shape upcoming strategic business models, by way of collaborative decisions or predictive analysis. Feedback loops hold heavy potential because the insights gained from feedback can largely improve all processes. Software can be appropriately designed to drive workflow automation tools to help in lead generation and tracking, design special offers for specific customer segments, feed automated alerts to customer support centers, and fine-tune product recommendations in online and offline business sources. CRM leaders, IT teams and top executives must work in harmony to automate customer decision making using the seek, analyze, model and adapt framework. They must also work together to acquire, manage, analyze and apply big data insights successfully to customer processes. Privacy: No matter how active and informed today’s customers are, a small speck of doubt always remains. Hence, it is important to ensure that appropriate information is revealed to customers, and requested from them to reveal as well, so that they never experience violation of their privacy. Timing: Correct timing can make or break things. Every customer opportunity contains an apt time frame within which offers and messages must be communicated. Promptness in resolving customer queries and addressing grievances is also vital. Channels: Channels and individuals who deliver offers/ messages should be very carefully selected, since this largely influences customers’ decision making actions. Additionally, the tone of messages must be in sync with the kind of offer being made as well as the channel through which it is delivered. Consistency: Big data brings big opportunities. But with these voluminous opportunities come the likelihood of bombarding customers with excessive, inconsistent or even contradictory messages. If the thin line between informing and bombarding is crossed, customers may be lost for life. Customer-centric strategies encounter both opportunities and challenges from big data. Gigantic, complex data sets can definitely offer significant value and insights to organisations, however, most organisations are still unable to put a finger on what exactly the accrued benefits are. This is what needs to be addressed first. With progressing time, data sets are increasing in complexity and diversity, which can be complementary to business processes and CRM solutions both. These diverse data sets also assist businesses to fill in any vacuums in the system, as a direct consequence of which, operations, decisions and business delivery are significantly improved. The complexity does not lie in information resources – it lies in the growing demand for fresh and efficacious forms of information capture, storage, management, integration, conversion, and finally analytics.